Norwich is no stranger to ice cream: Lakenham Creamery has been churning the sweet stuff for almost 100 years, and has won more than 120 awards in that time. Meanwhile, in the city centre, the traditional Ronaldo Ices barrow is a familiar site to everyone here. What the city didn’t have, however, is gelato, ice cream’s fancy Italian cousin. There are plenty of differences in the ingredients and method – gelato has a lower fat content, often doesn’t include eggs in the base, and is churned slower to incorporate less air. As it’s kept at a higher temperature, gelato is softer and smoother and doesn’t require that arm-juddering drag with a scoop that ice cream can entail. You can read about the difference on the wall of Cafe Gelato while you wait, as queues going out the door of the small gelato parlour aren’t unheard of, despite it having only been open a year. Husband-and-wife team Sandro and Jenny serve a rotating selection of seasonal flavours of gelatos and sorbets, as well as the usual suspects, concocted behind the door that bears a tantalising “Gelato Lab” sign. 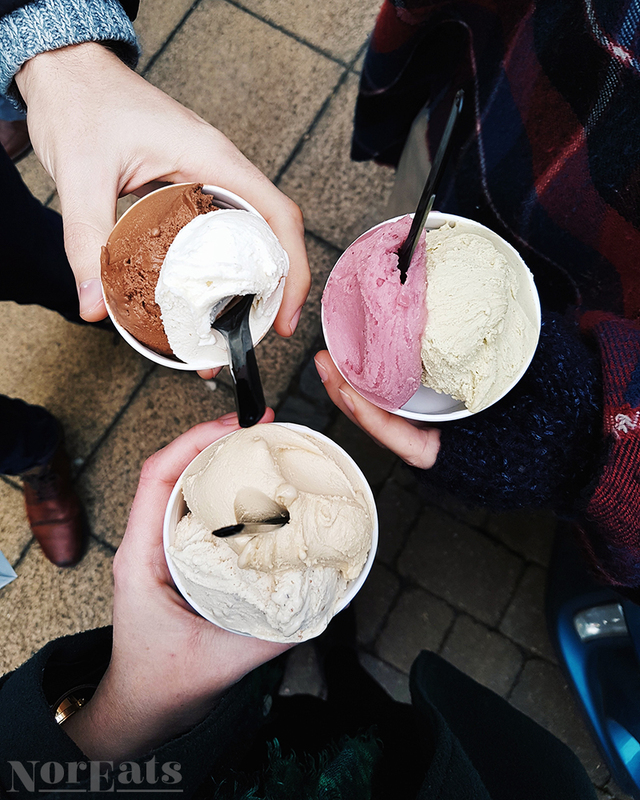 Having seen the shop run out of all but two flavours during a rush even during the cold of a February afternoon, we’d say this little slice of Italy is very much at home in Norwich.